Earning an entrepreneurship associate degree online will prepare you to run your own business. In as few as two years, an online entrepreneurship degree strengthens accounting, marketing, and business administration skills. Earning an entrepreneurship associate degree online allows you to complete coursework according to your schedule. An increasing number of individuals choose to launch their own companies, thanks to technological advancements and growing demand for innovative products and services. In 2015, The Bureau of Labor Statistics reported that, 15 million people—10% of the total employed U.S. population—were self‐employed. An online entrepreneurship degree will prepare you to launch and grow your own business. What can I do with an Associate in Entrepreneurship degree and what will I learn? See also: What can I do with a Marketing degree? 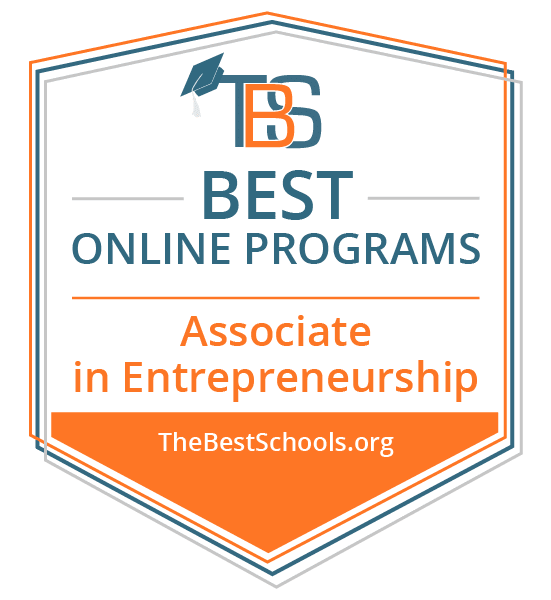 Macomb Community College ranks #1 on The 10 Best Online Associate in Entrepreneurship Programs! Macomb Community College's associate of business administration in entrepreneurship program gives students a firm background in fields like accounting, marketing, and information technology. Graduates leave school prepared to become innovative leaders in a variety of fields. Based in Warren, Michigan, Macomb offers an extensive business-focused curriculum that includes courses like entrepreneurship fundamentals, accounting for entrepreneurs, and global purchasing and supply chain management. The school's Center for Innovation and Entrepreneurship provides students with business coaching and other resources. Additionally, Macomb hosts a yearly pitch competition, where distance learners can get feedback on their business ideas and potentially win funding for their startups. The school offers financial aid and scholarships, and says that 80% of its students graduate debt-free. The credits earned in the program can transfer to most community colleges and universities with the same accreditation as Macomb. Candidates who know they want to pursue a BBA at another school following graduation are encouraged to meet with an advisor or counselor. Learners must complete 63 credit hours to graduate, which Macomb suggests they complete over the course of four semesters. Students may also complete the program entirely online. Macomb Community College is regionally accredited by the Higher Learning Commision (HLC). Minnesota State Community and Technical College ranks #2 on The 10 Best Online Associate in Entrepreneurship Programs! Minnesota State Community and Technical College's entrepreneurship program teaches students valuable business skills. Candidates learn in small class settings, taught by professionals and business owners who translate their personal success into enriching and engaging lessons and classroom discussions. Students carve their own path in the associate of applied science in business entrepreneurship program. Throughout their studies, they learn various business skills, including how to assess new enterprise opportunities, obtain financial resources, and market a venture for success. Courses teach distance learners how to create a business plan, select a leadership style depending on worker maturity, and use technology applications to meet business objectives. Students must complete 60 credit hours to graduate; these credits include business and general education courses. Candidates may complete the program entirely online and in two years. Located in Fergus Falls, Minnesota, Minnesota State boasts strong ties to its local community. The school's Entrepreneurial Services Center on the Detroit Lakes campus offers business guidance to individuals. In addition to its associate degree program, Minnesota State also offers four other diplomas and certificate programs in entrepreneurship. Minnesota State Community and Technical College is regionally accredited by the HIgher Learning Commision (HLC). Genesee Community College ranks #3 on The 10 Best Online Associate in Entrepreneurship Programs! A key factor separating this online entrepreneurship degree from similar programs is its emphasis on e-commerce and retail business management. Students in Genesee Community College's hybrid associate of applied science of entrepreneurship program have the opportunity to use a retail business management laboratory, where they can experiment with different merchandising techniques and strategies. Since the college is based in Batavia, New York, students can take class excursions to nearby retail and entrepreneurship hubs like Toronto and New York City. And for those interested in taking their entrepreneurship career overseas, students can study abroad. Students can complete most of this program online, though they must take some classes in-person. Genesee's online classes follow the same academic calendar as the in-person courses. The credits earned in this online associate degree in entrepreneurship can also transfer to nearby four-year institutions like Fashion Institute of Technology, Rochester Institute of Technology, and SUNY College of Buffalo. Students need to earn a total of 64 credits to complete the degree, which are in business and general education courses. With Genesee's program, students find themselves with a strong foundation when it comes to career fields or entrepreneurship degree jobs like operations management, accounting, information technology, and merchandise management. Degree earners also participate in a full-time internship during the program, expanding their career options following graduation. All of the programs offered at Genesee have been approved by the State University of New York. The school is also a member of the American Association of Community Colleges. Craven Community College ranks #4 on The 10 Best Online Associate in Entrepreneurship Programs! Craven Community College's associate of applied science in entrepreneurship curriculum is offered entirely online. Required courses include entrepreneur marketing, entrepreneur issues, and funding for entrepreneurs. In total, students need to complete 69 credits to graduate, and those who take a full-time course load can finish in two years. Craven's program helps students develop valuable professional skills. The school notes several fields where students might find entrepreneurship degree jobs, including personal supply services, lawn and home care, real estate, and management and public relations services. Located in New Bern, North Carolina, Craven serves over 3,000 curriculum students, along with 10,000 continuing education students. For those who live nearby, the school also offers hybrid classes, which combine both in-person and digital instruction. Craven provides a distance learning handbook and phone support for students who may experience technical issues. Some of the resources for online courses include a writing lab, an MLA writing support service, and Smarthinking, an online tutoring platform. Craven Community College is accredited by the Southern Association of Colleges and Schools Commision on Colleges. Cowley County Community College ranks #5 on The 10 Best Online Associate in Entrepreneurship Programs! Leadership is the driving force behind Cowley County Community College's entrepreneurship program. The associate degree from the Arkansas City, Kansas school equips business professionals with the necessary skills to succeed as leaders in the workplace. Candidates must complete a total of 63 credits to graduate, which are spread out across general education courses, a business core curriculum, and six credits in leadership elective coursework. Full-time students can complete the program over the course of four semesters, or two years. Almost every class at Cowley tackles a different dimension of leadership. This makes students not only valuable business leaders, but also provides them with a rigorous understanding of the values of leadership in personal and professional life. Cowley's associate of applied science in entrepreneurship and business leadership program gives students more access to their instructors and the chance to reach out with questions or comments through the school's Blackboard system. The school's online curriculum isn't self-paced, so students still need to follow a specific academic and scheduling calendar. Some courses may require learners to take exams in person, so online students should take that into account when scheduling their coursework. Tuition and fees vary depending on a student's residential status. The school also offers financial aid programs, scholarships, student loans, and tuition payment plans. Cowley County Community College is accredited by the Higher Learning Commision and the Kansas Board of Regents (KBOR). Forsyth Technical Community College ranks among The 10 Best Online Associate in Entrepreneurship Programs! Forsyth Technical Community College believes innovative and creative thinking skills, a strong tolerance for uncertainty, and a self-nurturing personality are helpful qualities for success. The Winston-Salem, North Carolina school's associate of applied science in entrepreneurship curriculum includes a strong basis in entrepreneurship, along with coursework in business, computers, and economics. Online candidates must complete 72 credits to graduate, and may finish those over the course of four semesters and one summer term. Degree earners who take more than 16 credits in a semester are not required to pay for any additional credit hours. Financial aid and scholarships are also available. Forsyth Tech delivers its online courses through its Blackboard system, enabling students to access their coursework and communicate with their e-learning peers. Forsyth Technical Community College is accredited by the Southern Association of Colleges and Schools Commission on Colleges (SACSCOC). Great Basin College ranks among The 10 Best Online Associate in Entrepreneurship Programs! Great Basin College helps students reduce the entrepreneurial risks and conflicts of starting their own business. Mentoring is also an important part of the curriculum, helping ensure learners' success post-graduation. Students at the Elko, Nevada school complete three specific educational levels in the associate of applied science in entrepreneurship emphasis degree. Those levels are: 1. Individualized assistance in deciding on a specific venture, 2. An opportunity to try the business in a virtual small business world environment, and 3. A cooperative education experience working with a small business manager/consultant. The school requires 60.5 credits to graduate, which are spread out over general education coursework, a business core, and additional entrepreneurship classes and business electives. Students who take a full-time course load over four semesters can graduate in two years. Great Basin also allows candidates to continue into a bachelor's degree program. Tuition fees depend on a student's residency status in the state of Nevada, as well as the level of course they are taking. Great Basin Colleges is regionally accredited by the Northwest Commission on Colleges and Universities (NWCCU) and the Council for HIgher Education Accreditation (CHEA). North Hennepin Community College ranks among The 10 Best Online Associate in Entrepreneurship Programs! North Hennepin Community College transforms graduates into well-rounded business professionals by equipping its learners with a comprehensive understanding of human cultures, intellectual and practical skills, personal and social responsibility, and engagement. The associate of applied science in entrepreneurship program consists of 60 credit hours, which include a strong business core and a general education requirement. While the program provides immediate skills for those looking to start their own business or enter the workforce, students can matriculate to several bachelor degrees in-state, including business programs at Minnesota State University Moorhead, Bethel University, University of Minnesota Crookston, and Concordia University St. Paul. The Brooklyn Park, Minnesota school has offered online courses since 1997. Over $40 million in aid is awarded to students each year through scholarships, grants, and loans. The school is accredited by the Higher Learning Commission and is a member of the Minnesota State Colleges and Universities system. North Hennepin Community College is accredited by the Higher Learning Commision. College of Southern Idaho ranks among The 10 Best Online Associate in Entrepreneurship Programs! Students at the College of Southern Idaho can jumpstart their careers with its associate of applied science in business management/entrepreneur degree. The Twin Falls, Idaho school offers a business management technical certificate for students who have completed their first year of study. This certificate allows learners to become successful management professionals in retail operations while pursuing their associate degree. The curriculum gives students a strong foundation in business management, team-building, and analysis-based decision-making. Distance learners must complete 60 credits to graduate. While some courses can transfer into a four-year institution, like Boise State University and its bachelor of science programs, the degree is intended for students who wish to immediately enter the workforce. Candidates can find all of the school's entrepreneurship classes online, but some are only available at certain times of the year. The school offers resources of over $2 million of financial aid and scholarship aid. College of Southern Idaho is accredited by the Northwest Commision on Colleges and Universities. Hudson Valley Community College ranks among The 10 Best Online Associate in Entrepreneurship Programs! Troy, New York's serene community serves as one of the biggest draws of Hudson Valley Community College's program. The school provides its associate of applied science in entrepreneurship students with an internship opportunity in their community. Hudson Valley requires 63 credits for graduation, which includes entrepreneurial courses and some general education requirements. Students may also take classes in intrapreneurship, and become innovators in existing companies by employing entrepreneurial strategies they learned. Graduates may transfer to a four-year institution, and a certificate program is also available. Hudson Valley offers an extensive amount of digital resources for online students, including learning centers, library services and databases, and a center for access and assistive technology. Tuition rates vary based on state residency. Hudson Valley Community College is part of the State University of New York system. Hudson Valley Community College is accredited by the Middle States Commission on Higher Education. Many graduates of online entrepreneurship degree programs enter bachelor's programs. Earning a four-year degree builds on essential skills and knowledge gained during an associate program and increases earning potential. According to PayScale, professionals with a bachelor's in entrepreneurship earn an average $50,000 per year. Marketing: A bachelor's degree in marketing prepares students to oversee an organization's marketing strategy and to project the return on investment for promotional activities. Business Administration: Graduates of bachelor's in business administration programs often become account managers. These professionals collaborate with clients, government officials, and the media to maintain an organization's reputation. Entrepreneurship: After earning an entrepreneurship associate degree online, many graduates pursue a bachelor's in entrepreneurship, which prepares students to launch businesses or assume ownership of existing businesses.